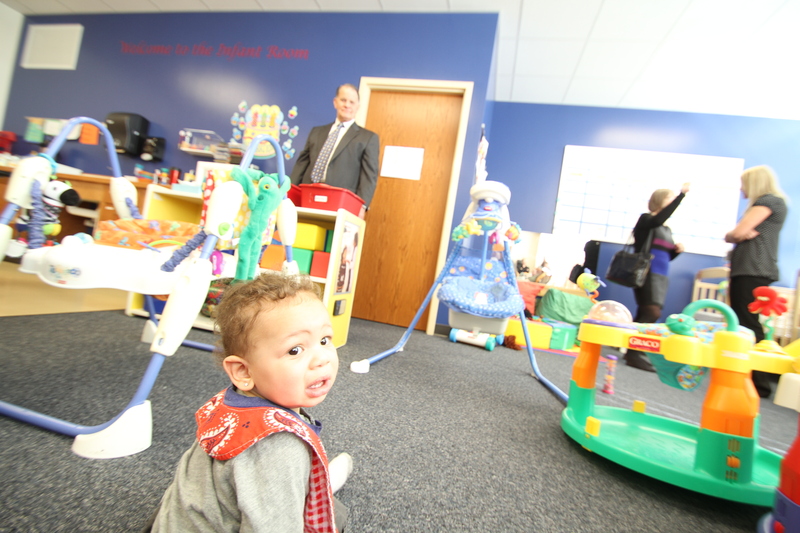 The Nebraska Children and Families Foundation Board of Directors tours the Sixpence-funded facility at the Bryan Community Focus Program. In most cases, when a high school girl has a child and decides to raise the baby on her own, it has damaging consequences for mother, child and the state. The mother will frequently drop out of school. The child will not get the education and interaction needed to prepare him for success in school. And the state of Nebraska will support them both via public assistance programs for years. The Sixpence site at Lincoln’s Bryan Community Focus Program gives high school mothers another path. A path to graduation. To college. To a child who is healthy, happy and school-ready. To a life of independence and self-sufficiency. It may sound like a tall order, but Nebraska Children and Families Foundation board members had a chance to see the program in action last month. And what they saw were lives permanently changed for the better. Teen parents work with their children as an early-childhood educator assists. The Bryan Community Focus Program takes high school students from around Lincoln who have complicated life situations. Teenage parents are just one of the groups that Bryan accommodates. The Sixpence program within Bryan takes a three-part approach by providing an in-school childcare center for kids age birth to age 5, mandatory parenting classes, and a voluntary home visitation program. “This program is unique because it allows young parents to complete their high school . . . when they’re starting out in a challenging situation,” said Holly Oman, a para-educator in the child care center. 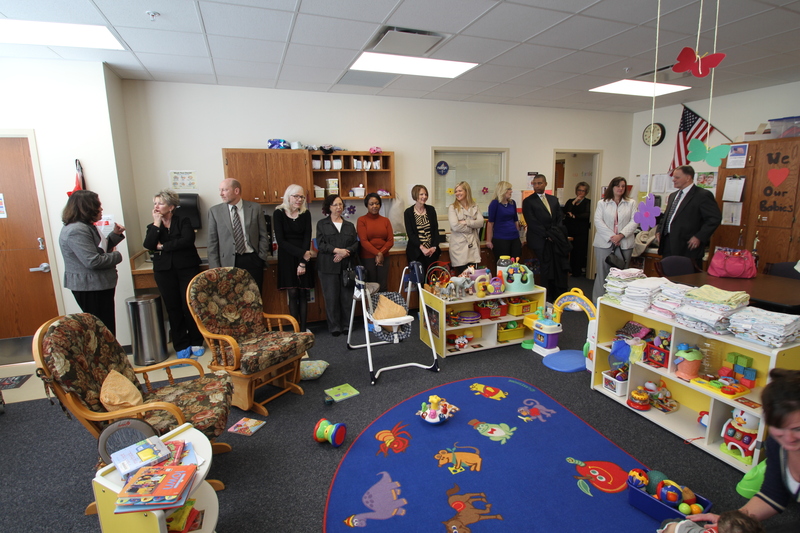 Baby plays in the infant room while board members mill around, getting their questions answered by moms and educators. Filled with books, laughter and age appropriate toys and activities, the child care center at Bryan is as warm and welcoming as a high-end daycare facility. Located in the school, teen parents drop their children off every day, and are welcome to come down and visit whenever they’d like. The kids themselves are cared for and educated by highly qualified para-educators. As a condition for using the child care facility, teen parents must enroll in a child development class. In these classes, students learn infant and child care basics – diapering, washing, feeding and the like. They also learn how to deal with tantrums calmly, how to make sure children are hitting their developmental milestones, and how to interact with their kids in a way that is stimulating and age-appropriate. Part of the parenting class includes twice-weekly, structured visits to the child care center, where the parents interact with their children with a number of activities. Each week, the parents take their kids to the school’s library for literacy time. “We really stress reading,” said Holly. The program boasts a high graduation rate among the teen parents who participate, and kindergarten readiness for the children in the center. Most of the moms we talked to were graduating in spring or fall, and had plans in place to attend Southeast Community College. Nebraska Children and Families Foundation supports children, young adults and families at risk with the overall goal of giving our state's most vulnerable kids what they need to reach their full potential. We do this by building strong communities that support families so their children can grow up to be thriving, productive adults.